Mineral ascorbate blend providing approx: Vitamin C 49mg/Calcium 3mg/Magnesium 2mg 59mg, Iron (bisclycinate) 6.7mg, Zinc (citrate) 4.8mg, Natural beta carotene/D.salina carotenoid mix providing: Beta-Carotene 500ug/Cryptoxanthin 3.9ug/Alpha Carotene 15.8ug/Zeaxanthin 3.2ug/Lutein 2.5ug, Vitamin B5 (calcium pantothenate) 5mg, Vitamin B3 (nicotinamide) 5mg, Choline (bitartrate) 2mg, Vitamin D2 (ergocalciferol - vegan) 7.4ug, Potassium (citrate) 1mg, Vitamin E (d-aplha tocopheryl) 2.5mg, Selenium (L-selenomethionine) 12ug, Manganese (bisglycinate) 0.25mg, Inositol 1mg, Copper (citrate) 0.33mg, Vitamin B2 (riboflavin) 0.5mg, Vitamin B6 (pyridoxine HCI) 0.4mg, Vitamin B1 (thiamine HCI) 0.3mg, Biotin 0.2mg, Vitamin K 10ug, Iodine (potassium iodide) 63ug, Chromium (picolinate) 10ug, Folacin (folic acid) 55ug, Molybdenum (ammonium molybdate) 2ug, Vitamin B12 (cyanocobalamin) 0.4ug. Directions: As a food supplement, take one to three capsules daily with food, or as directed by your healthcare practitioner. 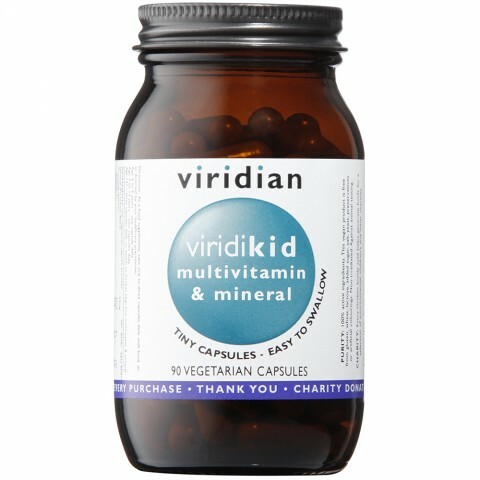 Ê Age 2 to 6 years Ð one capsule daily Ê Age 7 to 13 years Ð two capsules daily Ê Age 14+ - three capsules daily, or switch to Viridian High Five multivitamin & mineral.